Christopher Peck, CEP®, CRPC®, CMP™, is president of Peck Financial Group and has served clients throughout Greater Milwaukee since 1992. He specializes in helping people understand their complete financial picture, addressing investments, insurance, IRAs and 401(k) rollovers, and tax and estate planning. Clients rely on Chris for intelligent wealth management strategies that help preserve assets, avoid probate, increase income and reduce taxes. His investment portfolio design strategy centers on each client’s specific goals, risk comfort level and time horizon. Through seminars, workshops and articles, Chris helps clients make confident decisions about retirement and estate planning. He provides insight and guidance on issues including Medicare and Medicaid, long-term care, and maximizing Social Security and income. Chris stays on top of regulatory changes and economic trends through ongoing education. He is a Certified Estate Planner™ CEP®, a Chartered Retirement Planning Counselor™ CRPC®, and a Certified Medicaid Planner™ CMP™. 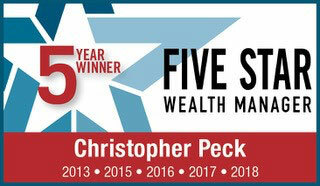 He is also a multi-year winner of Milwaukee Magazine’s Five Star Wealth Manager award. Chris and his family live in the Milwaukee area, where his community commitments include the Gradient Gives Back Foundation, helping poor, distressed or underprivileged American families at risk of losing their homes. Chris is also an avid cyclist and occasional bass and harmonica player. All written content on this site is for information purposes only. Material presented is believed to be from reliable sources; however, we make no representations as to its accuracy or completeness. All information and ideas should be discussed in detail with your individual adviser prior to implementation. The presence of this web site shall in no way be construed or interpreted as a solicitation to sell or offer to sell securities or investment advisory services to any residents of any State where otherwise legally permitted. Past performance is no guarantee of future results and investors can lose money. Securities and Advisory Services offered through Harbour Investments, Inc. Member FINRA/SIPC Securities Licensed in AZ, CO, FL, NV, UT, WI. Peck Financial Group, Harbour Investments, Inc. and Christopher Peck is not affiliated with or endorsed by the Social Security Administration or any government agency. This content is for informational purposes only and should not be used to make any financial decisions. Exclusive rights to this material belongs to GPS. Unauthorized use of the material is prohibited.